Retreat Update: Let These Testimonies Prophesy to You! I want to tell you what God did at the inner healing retreat, but I still feel at a loss for words about it! I will say that it was incredible. It was fantastic. I don’t have a paradigm to easily describe what Father did for all the attendees (and even for the ministry team and myself), but I’ll try. I’m also interspersing testimonies throughout this report, so PLEASE read the testimonies. The testimony of Jesus is the spirit of prophecy. What someone else testifies about, God will do in YOUR life if you’ll receive the testimony. This photo does not show all of our attendees, but it does show most of us! It was an unbelievably-awesome time in the Lord! My immediate answer was in the affirmative, but I thought of the pain in my heart I had had so long. Prayer, fasting, and being with God’s people alleviated it, but it never went away. I came to the retreat very wounded. God stores our tears in a bottle, but I wouldn’t be surprised if mine filled a swimming pool. I searched my heart for unforgiveness. I repented of some things. I kept pressing in. The next day, Jamie was preaching about soul ties. I thought I had cut off all my soul ties already, but Holy Spirit showed me I still had soul ties with my brothers who molested me. I thought of how all my life I had thoughts (that sounded like things my brothers would say) inside me that told me I was fat and nothing I did was good enough, and even my core self was inferior and lacking. I devoured the Word and I knew what God said about me was true, yet those thoughts would never completely leave even when I declared God’s Word and fasted and prayed. At the retreat, I broke that soul tie. Instantly I felt lighter and free. I was finally free from that accusing voice. I was free from feeling condemned because I thought I hadn’t forgiven people. Jamie’s note: The sister who shared the testimony above cried buckets of tears the first two days of the retreat. But after the Lord showed her the key and freed her, she glowed and smiled. Her face became bright again. GLORY TO GOD! Holy Spirit sat down on this retreat in POWER. People were radically transformed. People who came in depressed, discouraged, suicidal, and bound told me that they were leaving absolutely free. They said they felt light and airy afterward. They said they felt JOY again, the same joy they felt when they first got saved. People whose eyes were dark and sad when they arrived went out with LIGHT just pouring from their faces. Their eyes became bright and happy, and it was a visible change. Wow! I want to thank each and every one of you for this heaven-sent retreat. The teaching came forth with great power. The intecessors flowed like angels. The shofar, worship, everything flowed in unity and was supernatural. Even my cabin-mates were God appointed. I now feel as if light is shining inside. I am more stable in Christ. After baptism, I feel as if my spiritual eyes were opened. I also recieved healing from tremors by faith after three of your angel intercessors prayed for me (Janis, Jo Ann and Madaline). I know I will be discovering more about the retreat’s impact in the days ahead. I am impressed with the loving care and attention given to us and how much you all poured out – until the very last minute there you were. Thank you, prophetic team–Karen, Mamie, Dawn, Eva and Madaline. And thank you, Jamie, for bringing this to us. May the Lord bless you and yours thousand fold. We also had one person saved. There is JOY in Heaven when one lost person gives their heart to Jesus! A precious sister gave her heart to the Lord for the first time at this retreat, and she experienced immediate change in her heart, emotions, and countenance! We saw immediate evidence of the change in her as well. Praise God! JESUS saves! He heals! He delivers! He raises you up to walk in newness of life by His Spirit … and it’s easy! People lining up to be baptized. No, we did not hit anyone with canoe paddles! People used them to keep their footing while walking in the lake. 34 people followed the Lord in baptism, to the glory of God! I am myself, for maybe the first time—ever. I have dreams that are my own, a destiny that is mine, and a real true knowing that God is for me and that is all I need. I feel the constant presence of Holy Spirit. I know who I am and Who I belong to. I know that I am necessary and loved, just because I’m a child of God. I am brave. I am bold, and the Good News has made me glad. I am eager to now to put everything at the feet of Jesus, because I feel UNSTOPPABLE. 34 people also followed the Lord in baptism by immersion. A pastor friend who was attending with his wife helped with the baptizing. Thank God for that; I would have been in a pickle without his help! I had never done baptisms before. But God moved and we had a great time! 34 people followed the Lord in baptism, and a wife even baptized her husband! Glory to God! 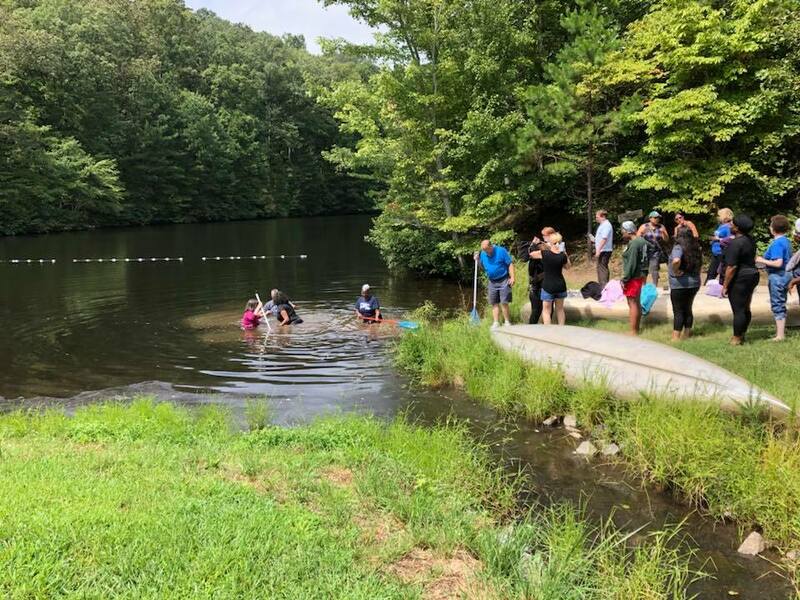 “I’m eternally grateful for the Lord’s work of Healing, and the outpouring of the Holy Spirit at the Rosh Hashanah Inner Healing Vision Retreat. I came with a wounded and anxious spirit due to years of brokenness and suffering. 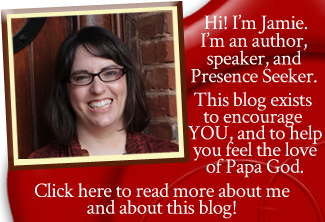 I was anxious because I knew the Holy Spirit led me to Jamie’s blog for a plan and a purpose. I’ve been asking the Lord to heal me for a long time. Oh, what a mighty God we serve! This retreat was my answered prayer. The burdens have been lifted, I walk with authority, power, and dominion; ready to labor for His Kingdom. It was a pleasure to meet you Jamie and your family, thank you for allowing God to use you as a diligent vessel to pour into others. Every attendee also had a personal prophetic appointment with our ministry team of prophets. Beloved, if you’ve never sat with a team to receive personal prophecy, you MUST. Personal prophecy is life-changing. And every person had an appointment of 10 minutes’ duration (some longer, if no one was waiting). During the appointments, the person comes and sits with a team who doesn’t know anything about them. The team just asks the Lord for a word. And then the Lord gives visions, encouraging words, words of knowledge, words of wisdom, etc for that person–all without the team knowing a thing about the person to whom they are prophesying. The first day, I was greeting people and checking them in while the prophetic teams did personal appointments. I consistently saw people come out of those appointments with big smiles and happy tears. God touched them radically. I knew we were supposed to be on this retreat the moment it was offered. We are beyond blessed to have been able to go. It was worth every sacrifice to be obedient to the Lord. We’ve had some prior experience in inner healing, and were currently dealing with issues that needed to be resolved. I knew this was an appointment with God, on His calendar. My personal experience during the prophetic appointment was almost unbelievable. I KNEW beyond anything I’ve EVER experienced that these ministers were hearing God for me. They spoke into my life and brought the pieces of my shattered heart back. It was specific and personal; only God knew some of the prayers they spoke about! Another experience was learning that church wounds are actually mother wounds. This retreat helped me unlock some areas in my heart and are allowing God in to heal me. We also received a request from our son during this time; he asked his Dad to baptize him! Can you say RESTORATION?! Go, God! Then, there were the class sessions–the meat of the whole event. And so, so much more. We also ministered resurrection for dead and forgotten dreams. We talked about pursuing your calling. And dozens of people surrendered their lives to day-and-night prayer, to become intercessors. We also saw dozens of people surrender to put their hands to the Gospel plow and pour out their all for the Great Commission. Every class session was powerful. You could feel the presence of the Lord in such weighty splendor. Joy returned. People laughed and tears flowed too. People knelt and wept. They laid on their faces before the Lord. Bodies were strewn everywhere as people worshipped and received from the living God. We had about 60 people there the whole time, plus additional folks who came when they could. That’s a lot of people changed. Just wanted to share what Holy Spirit showed me when we were renouncing inner vows. First, you need to know I grew up Catholic, which means we ate fish on Fridays–fish sticks to be exact. “Yuck” is all I am saying. Secondly, I have been wondering a lot about why I have never been able to lead anyone to the Lord–no opportunities presented to even attempt. This morning (Wednesday) when you shared the prophetic word in Ezekiel, you said that the fish in the river were souls. A light bulb went off in my head. I was like, “Huh? The fish in the river are souls?” I pondered it in my heart. When you were talking about inner vows, and we were to write out our list, fish was the first thing on my list. My vow was that I would never eat fish again. I hate fish. I didn’t want anything to do with fish. Holy Spirit showed me that these fish represented souls (Ezekiel teaching) and that I hated those souls and I didn’t want anything to do with those souls. WOW is what I said. I have been praying the last year for God to show me how to love people the way He does, but I had a fish-hating inner vow that a must be dealt with. “I just shared the powerful testimony of [one of our ministers] with my sister in Christ. She was still suffering from pain that she was not aware of from an abortion. When I started to share the testimony she started crying. It was God that told me to tell her, because I had forgot being caught up in all the excitement of telling her about my healing and deliverance. I took her through the meaning of the clap and severed the ties of guilt and shame and she said she felt the release. She said it felt like from the top of her head that it all just peeled away. HALLELUJAH!!! I put my toes in the water. I also came back and help set my mother free from the spirit of control and manipulation. She said she was praying and asking God this morning to set her free. When I started telling her about our wonderful time, she said God knew you had to go because I needed the deliverance. I was thinking this morning that she should have been there. Beloveds, God did all these things–and He used YOU together with us as His hands and feet to do them. This retreat cost between $13,000 and $15,000. Registration fees only covered a portion of the cost. The rest of the cost came from your donations, product purchases, and partnerships. If you feel led to give to help cover the cost of this retreat–and the cost of our overhead–then we would sure be blessed by that. You can give here via PayPal or here via Gumroad. If you prefer to give via snail mail, our address is: From His Presence, PO Box 25232, Chattanooga, Tennessee 37422 USA. It’s all about seeing people transformed by Jesus’ love. And at this retreat, He did just that. Father God showed out and manifested His glory. It was unspeakably awesome, and I’m grateful. THANK YOU to all who attended–and thank you to ALL of you for supporting this ministry with your prayer, participation, and gifts! We love you in the Lord! 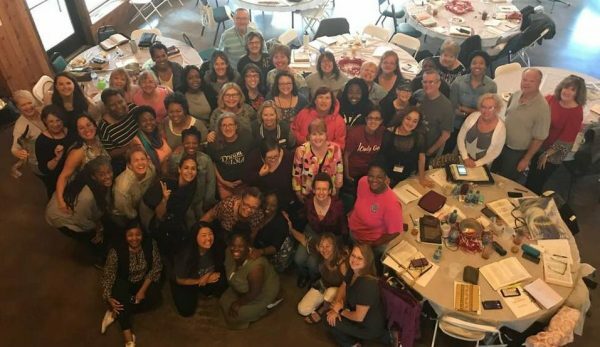 AWESOME BEAUTIFUL AWESOME…..I KNOW GOD POURED OUT DURING THIS RETREAT BECAUSE THE ENEMY HAS BEEN BATTLING TRYING TO STEAL MY JOY….BUT ALL I CAN THINK ABOUT IS THE SONG “RECKLESS LOVE” that he will tear down everything just to come for me!!! I AM FREEE AND I LOVE IT!! I CAN’T WAIT UNTIL NEXT YEAR I TOLD MY MOM SHE HAS TO GO!! Wow!. Wonderful testimonies. I pray that next year, the Lord’s will, I will be able to be part of it. Our Lord is so good. Let us give praise and adoration to the King of kings and the Lord of Lord’s for the manifestation of His power. Jamie please pray for me. Beautiful testimonies. Awesome God. Obedient People. You and your team are fantastic. Reading these testimonies here in Jhb, SA. I could feel the anointing and love of Father God just by reading these testimonies. Before I read them I prayed that Father God what you did for your precious people at this retreat You will do for me and I could just feel the awesome presence peace and joy and sadness uplifted from me. As you described how the people left different to what they came in as, I was just so excited and could virtually see feel and grasp the anointing at your Retreat and all I could see was my own face and heart enlightened and felt that tangible touch of the Holy Spirit. When I read clap – I did the same and I believe that Father God touched me today in a very special way by just reading your testimonies….. In your presence Father I am healed, I am made whole, I am restored, I have peace, I am encouraged and uplifted. Bless you ALL. Jamie, I love Jesus and you have really helped me a great deal in drawing closer to Father God. WOW. THANK YOU JESUS. HALLELUJAH for the awesome life building / saving testimonies. (which I patiently waited for). Awesome! Jamie I have been so blessed just by reading the testimonies exactly what was being said yes it’s God anointing and power of the Holy Spirit that he has given us. Now I feel moved doing the same thing in our church we are having a conference in October. I am looking forward to it. God has put encouraging words and work to be done for his will be done. I am so blessed just to read and pray that he is going to do the same in our church. The spirit is going to move there is going to be prophetic word, healing, testimonies, and much more I feel it in my soul I am claiming it. Thank you that you came to my website I started reading the Presence seeker and I have been blessed over and over again. It was what I needed. I do volunteer work in my church since I retired. God has blessed me tremendously.